The Taoiseach has joined the Football Association of Ireland in calling for a replay following last night's controversial World Cup play-off match. 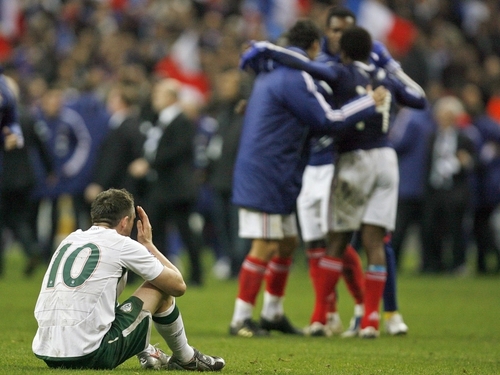 The second leg of the play-off ended 1-1 on the night at the Stade de France in Paris; but France went through 2-1 on aggregate following the controversial late goal. French striker Thierry Henry controlled the ball twice with his hand before squaring to Gallas who headed home from close range for the winning goal. However, as a football row becomes political, French Prime Minister Francois Fillon responded by saying that the Irish government 'should not interfere' in footballing decisions. The FAI made an official complaint this afternoon, calling on football's governing body to organise for the match to be replayed. In a news conference in Dublin, Irish manager Giovanni Trapattoni called for FIFA and UEFA to look at the use of video technology. However he added that he believed it would be impossible for the match to be replayed. FIFA had earlier ruled out any chance of a replay. A spokesperson for the world football governing body flatly dismissed calls for a rematch, referring to Law 5 in the official rules of the game. Speaking on RTÉ Radio, Mr Brady was also critical of FIFA for seeding the play-off draw to favour the bigger teams. Henry admitted that he handled the ball in the build-up to the goal, but said it did not change anything regarding the fact that he was happy that France had qualified. The matter was raised in the Dáil this morning, with Fine Gael's Alan Shatter calling on FIFA to vigorously pursue the use of video referees. Mr Shatter also called on the Dáil to congratulate the Irish team on its performance, in a game 'that had been won by sleight of hand'. He said the game had contaminated the reputation of the World Cup, and called for a meeting of Ministers for Sport, to get an EU Directive requiring the use of video referees in soccer. Taoiseach Brian Cowen earlier congratulated the Irish Team on 'a most courageous performance'. He complimented the players on a heroic effort to secure a place in the finals of the next World Cup. However, Minister for Justice Dermot Ahern joined those calling for a replay, after the blatant handball put France into the World Cup. Mr Ahern has said FIFA should be called to account in the interests of fair play. ‘They probably won't grant it as we are minnows in world football but let's put them on the spot,' the minister said. Ireland were widely praised as the better side over the two-leg play-off, which they lost 2-1 on aggregate.